This lovely charm bracelet for women will be a constant reminder of the unsevered bond you share with your loved one. 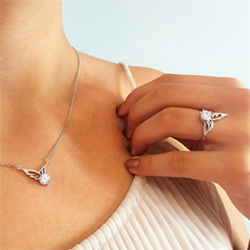 The saying on the heart-shaped pendant fondly reads: »When I listen to my heart, it whispers your name«, an expression of deep love and devotion. I bought this to remember my mother. Jewelry is beautiful and the customer service is helpful! Excelente combine with the others I Order! I wear this in combination with the other bracelet I bought. I bought bracelets & a necklace,ALL were beautiful & expressed the feelings of loss after losing my husband in June,2018. I am giving them as Christmas gifts for our girls & granddaughters. The jewelry is even better quality than I thought it would be & I can honestly recommend them. I just love my beautiful bracelet. I’ve had many compliments. Bought this bracelet for myself and purchased the other for my step-daughter who I am sure will love hers also. It is beautiful. I plan to order agin soon..